Oct 22, 2010 – Deceptionist Richard Hatch, whose sleight of hand performances have taken him to such exotic venues as the Kingdom of Bahrain and Eddie Murphy’s New Year’s Eve party, will appear and perform at the upcoming Seussical Family Carnival at USU’s Chase Fine Arts Center starting on October 28th. Hatch’s appearance is sponsored by the Hatch Academy of Magic of Music, a performing arts conservatory offering lessons in sleight of hand and violin playing, scheduled to open in Logan this January. The Seussical Family Carnival will be the Hatches’ first public appearances in Cache Valley in more than two decades, though they hope to perform here frequently now that they have made it their home. The Carnival is free and open to the public in conjunction with the Utah State Theater production of “Seussical the Musical.” Dates and times for the Carnival are Oct. 28th from 5 to 7 p.m., Oct. 29th from 9 to 10 p.m., October 30th from noon till 2 p.m. and from 5 till 7 p.m., Nov. 5 from 5 to 7 p.m. and Nov. 6 from 5 to 7 p.m.
For more information about the Carnival contact Courtney Lewis, Caine College of the Arts, 435-797-9203, [email protected]. For more information about the Hatch Academy of Magic and Music, contact Richard Hatch, 435-932-0017, [email protected]. Although Richard Hatch holds two graduate degrees in Physics from Yale University, he finds it easier apparently to violate the laws of nature than to discover them. He has been performing his unique brand of magic full time since 1983. In 1985, shortly after winning first place in the annual New England Close Up Competition in Worcester, Massachusetts, Richard moved with his wife, violinist Rosemary Kimura, to Houston, Texas where they were based until moving to Richard’s hometown of Logan, Utah this fall.. For several years he honed his craft entertaining the guests as one of the house magicians at Houston's Magic Island Nightclub before devoting himself exclusively to private and corporate work, traveling internationally on behalf of his clients. 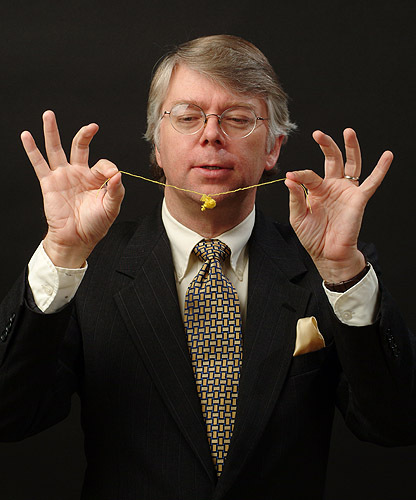 Hatch is a member of the Academy of Magical Arts, the International Brotherhood of Magicians, and is a lifetime member of the Society of American Magicians. Among magicians he is known as the translator from German into English of works about Johann Nepomuk Hofzinser (1806 – 1875), Paul Potassy, and the first four volumes of Roberto Giobbi’s acclaimed “Card College” course of card manipulation. This past year he was a featured performer at the exhibit "Magic: The Science of Wonder" at the Houston Museum of Natural Science. Samples of his sleight of hand work as featured at the Museum may be viewed at http://vimeo.com/9353935. Rosemary Kimura received her Masters degree from Yale School of Music and her Bachelors Degree with Performer’s Certificate from Eastman School of Music. She has studied Chamber Music with the Fine Arts, Tokyo and Cleveland Quartets and with Raphael Hillyer. She has performed with the New Haven, Hartford, San Antonio and Houston Symphonies and with the Houston Grand Opera. Her principle private instructors have been Sergiu Luca, Syoko Aki, Peter Salaff, Charles Castleman and Martha Katz. As a teacher herself she has been on the faculty of Music Schools in New Haven, Milwaukee and Houston. She has spent the past three summers on the faculty at the Interlochen Summer Arts Camp in Michigan. She and Richard Hatch were married in 1982 and have two children, Catherine and Jonathan. About the Hatch Academy of Magic and Music: Conceived as a combination of Hogwarts and Juilliard, the Hatch Academy is slated to open in Logan, Utah in January 2011, offering private and group lessons in sleight of hand and violin playing. The instructor/founders are deceptionist Richard Hatch and violinist Rosemary Kimura.